A once marvelous Magic Kingdom is now governed by evil. Only when the magic box collects enough sweet songs from Earth, can it regain its power and defeat Abawoo. When Mogamarat Al Banda discovers this, he and his animal friends decide on an exciting adventure to rescue the Magic Kingdom. 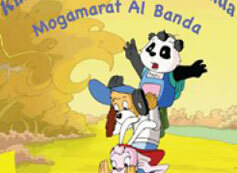 With his army of friends, his kung-fu skills and trusty kung-fu book, Mogamarat Al Banda embarks on an epic journey. With great optimism, a strong sense of justice and their unshakeable belief they overcome all obstacles.